This is probably as close to “Dinner at The White House” as I will ever get. On this, the week before the ELECTION, I headed up to Miya’s for their New Haven Restaurant Week 2016 White House Champions of Change dinner. New Havens Restaurant Week, which runs from 10/30- 11/4 gave Bun the opportunity to offer the menu he and his mother created for President and Mrs. Obama at last months White House Champions of Change Dinner. He was one of only twelve Sustainable Seafood honorees and the only chef awarded this respected award. While this menu is only available for a limited time, many of these dishes are available on Miya's regular menu. Every dish includes fresh ingredients, and uses invasive species like Japanese Knotwood, Chesapeake Bay Blue Catfish, and Asian Shore Crab. The Blessed Ba-Rack of Ribs are Applewood Smoked invasive carp ribs, and although a little bony are tender and have a nice smoky flavor. The Restaurant Week menu includes 14 unique yet understandable dishes many creatively presented on lava stones or burnt wood. The menu begins with a Chinese Firecracker Sake Bomb, spicy sake dropped into a half glass of Sapporo beer and quickly downed. Definitely helped put me in that adventurous dining spirit. Some of the highlights of the White House menu included the Pumpkin Miso Soup, a Fall inspired broth of slow roasted pumpkin, sweet potatoes, and acorn squash with locally foraged invasive seaweed. The Kale Avocado Salad was light and one of the few items I actually recognized. A basket of Tempura Weed Chee was actually Japanese Knotweed leaves flash fried in whole wheat butter. Among the “sushi” rolls a favorite was the Pig Is Blanket, prepared tableside with Bun using a torch to cook the smoked bacon on top. 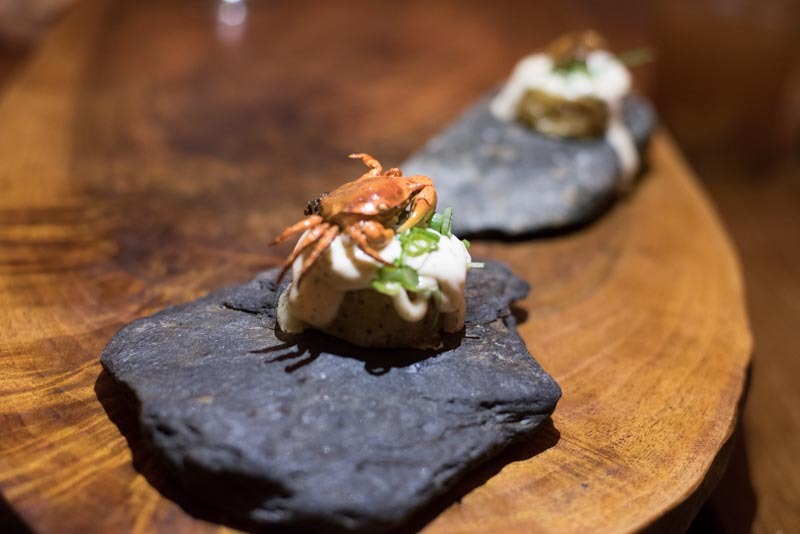 The Kanibaba was among the most beautiful and delicious items, a Potato Skin stuffed with invasive blue catfish, topped with cow’s milk cheese, and lemon dill sauce and presented on a black lava stone with a delicate Asian shore crab perched on top. Photo worthy and delicious, the creamy texture of the potato was balanced by the crunchy shore crab. 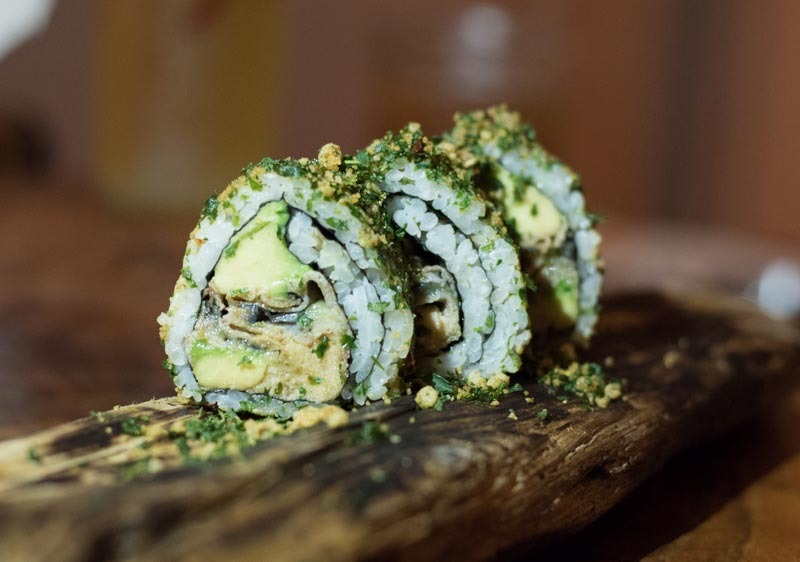 Other rolls included, Salam Sushi, of roasted eggplant, avocado, vegan cashew cheese and smoked jalapeno to add some kick, The vegetarian Ginger Eggplant Teriyaki roll, and the Hot Headed Cowgirl, a coconut covered roll of avocado, vegan cashew cream cheese, papaya, burdock and hot peppers. The coconut replacing the rice as topped was a sweet touch to the savory roll. The final bite of the menu was the sweet Seven Deadly Sushi dessert. A perfect one-bite roll of fermented sun dried banana, cashew butter, fresh strawberries, cacao nibs and homemade mocha and topped with baby scoop of coconut olive oil ice cream. As the menu suggests, “eaten in one bite”. Don’t miss this opportunity to feel like POTUS and experience Miya’s Champions of Change Dinner menu during New Haven Restaurant Week.